Here we are, just over four years since the initial “Very Best of WCW Monday Nitro” and we now have the third volume, so I’m sure the question on everyone’s mind has to be… “is the third time the charm?”. Well, stick with me and hopefully by the time you make it to the end I will have that answer for you. Be warned however, at the end I have some questions for you as well. Packed with more than 30 matches and almost 10 moments, this DVD set is stuffed with WCW Nitro, and the Blu-ray edition comes with an additional 6 matches and 2 moments. In total the DVD version clocks in at just over seven hours and more than eight and a half hours on the Blu-ray. The set spans Nitro’s entire six plus year run from the fall of 1995 through to March 2001. Before we get into some of the matches and moment, let’s take a look at Diamond Dallas Page’s segments. For me it is really cool that WWE has had DDP host all three volumes and having it done in the same setting it adds a sense of familiarity to the sets — hell, Dallas is even dressed almost EXACTLY the same in all three volumes! Dallas does a great job as host, as he provides a little backstory or anecdote to the matches/moments and segueing into the next. Lets move on to talk about some edits; who doesn’t love to hear about edits on WWE Home Video releases? Some of the more noteworthy edits include some theme changes such as Hollywood Hogan and Chris Jericho (whose theme has been replaced with his WWE one). 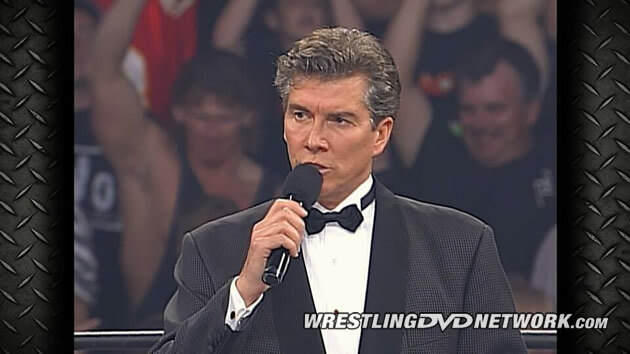 It should also be noted that Michael Buffer has not been removed from the set, as his introductions remain intact. Other noteworthy things to mention are that no date graphics are presented on-screen for any of the matches – which does make it a little difficult to frame the footage that you are watching. Also, in a move which I am sure will delight very few, WWE has opted to replace the now common plain black sidebars with the familiar ‘checker plate’ designed ones used on the first two Nitro releases, this time however there are no WWE logos on-screen throughout the entire presentation. Badd and Eddie left it all out there in this one; this was a really great match between the two. Sadly, WCW remembered their 10 minute time limit rule as I could have easily watched another 10 minutes of this one, and also sadly most will remember Marc Mero more for his WWE run, however he really did have some great matches in WCW in this era. Courtesy of the Blu-ray now we have this in-ring showdown between the Hitman and the Naitch in front of a rabid “Hotlanta” crowd at the Georgia Dome. Ultimately this would set up Bret Hart’s very first WCW match at Souled Out against Ric Flair. In fact this promo made me want to go back and see the match. This was a fun match; a really, really, really fun match. This was the antithesis of how awesome WCW cruiserweight action could be. Without question this was one of the true highlights of The Very Best of WCW Nitro Vol. 3 for me. Unfortunately, the name of this segment doesn’t quite do it justice. This one features a really lively backstage brawl between the feuding nWo factions – Wolfpac and Hollywood. Why are the Wolfpac so pissed, well this segment on the Blu-ray follows the match which got the Wolfpac all riled up. This was the type of segment which made Nitro must-see TV. This was a great match, like many WCW matches the announcers were distracted by just about everything else except the match, and we did cut away mid-match to Disco Inferno (ugh). However, the in-ring action here was really top notch. This might be one of the very last Hulk Hogan matches which we see on a WWE DVD for quite a while (maybe ever) and I must say I really enjoyed this one. It didn’t quite feel like your a-typical Hogan match as he and DDP brawled around the area. I was really very presently surprised with this one. Again, this was another match which I was really surprised how good it was. Granted it did have a degree of outside interference — in typical WCW fashion in that era. However, it was a very enjoyable match between Bret Hart and Jeff Jarrett. 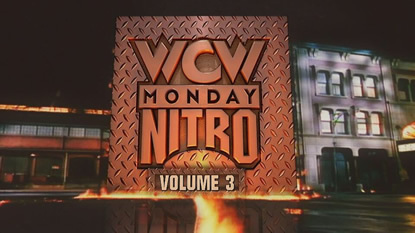 In fact Volume 3 of Best of Nitro should probably be titled: “Very Best of WCW Monday Nitro Vol. 3 – Best of Bret Hart in WCW” because there is a LOT of Hitman on this set. The very last match on the set and we go out with a BANG – and of course a Diamond Cutter. This one sees the recently reunited Steiner Brothers team up against Booker T and DDP. This wasn’t a long match but it wasn’t too bad. It comes from the “forgotten” era of WCW. When we all remember WCW we all seem to go from the Russo/New Blood era to the WWE purchase, however there was actually a few decent months of action in WCW before it all came to an end, so it’s nice to see some action from this era. Honestly, I have no real clue why this is on here. The only possible reason was that DDP really loved his feud with Macho. The segment doesn’t really mean anything and doesn’t really go anywhere. I understand why Macho Man vs. La Parka was featured on Volume 2, but this… I have nothing. This segment is one of those ones where I couldn’t decide if it was good or bad, simply because it is so very bad that it almost becomes good. If you ever wanted to see nearly 20 minutes of Buff Bagwell, Konnan and Vincent instructing the WCW crew to remove all the WCW banners, logos and T-Shirts then this one is for you. What better way could there be to start the final build in to the companies biggest ever match with Sting vs. Hogan at Starrcade? LOL. This one does exactly what it says on the tin. Vince McMahon loved to push people in his pool back in the day, maybe that’s why it’s here? F-luster C-uck… I have no more words. Is there a theme here, as soon as you put ‘Texas Tornado’ in the match name, it ends up on my “NOT” list. If you like seeing Sting and Luger brawl towards the beach and drenched in salsa, then it might be for you. I however prefer my salsa on chips. Overall, the set is a fun watch, but it did get a little stale at times and this did mean at times I felt it was a bit of a stretch to call some of this content the VERY BEST of WCW Monday Nitro, however it was still really fun at times. Some of the moments are those that we all remember, others are some which we have forgotten (maybe with good reason!) but all in all Vol. 3 of Best of Nitro was good and I’m sure that if you do pick it up, you will enjoy the majority of it. Why was it that it was always WCW fans that were the ones to throw crap in the ring? What percentage of matches from WCW Monday Nitro ended clean (without interference) vs. none and ‘screwy’ finishes? Do you think we have a Volume 4 of Very Best of Nitro down the road? – USA: Get your copy now here on Amazon.com or from WWEShop.com. – Australia: Get your DVD or Blu-ray now from WWEDVD.com.au. – UK/Europe: Pre-order for September 28th via Amazon.co.uk. I think three volumes (at three discs a piece) is enough of anything. 3 is always a good point at which to end a series, like a trilogy of sets. Is anybody else bugged by the fact that Volume 1 was ‘Very Best Of’ then Volume 2 was just ‘Best Of’, now Volume 3 is back to being ‘Very Best Of’? Whatever happened to uniform design for series? Volume 3 was nowhere near the very best. For a long time WCW fan, I found the limited amount of moments and the poor match choices to be a grave insult. I think WWE gave fans the middle finger on this set. Volumes 1 and 2 blows this out of the water by miles. Not sure I’ll be getting this. Seems like they have released most if not all good Nitro matches by now. I hope the next WCW release will be a Best of WCW Saturday Night. This isn’t available on the Network, and as long as that is the case, it should be a release that will sell well. I think WWE should concentrate on releasing DVDs featuring content notavailable on the Network. I’m a bret hart fan but a lot of matches here don’t seem like the VERY BEST. If there is money to be made and if the sales are sufficient enough then I can see a Volume 4. Not sure what is really left though as I believe majority of the good matches have been on previous volumes. Theres still enough to make a Vol 4 with only great matches. They haven’t put out enough Raven, Finlay, Regal, Badd, Saturn, Kanyon. I agree. I can think of so much more stuff that’s yet to be released to add to volume 4. I’m up for a volume 4! this set was good, but I felt Volume 2 had better Blu-ray exclusives though. I am looking forward to checking this set out, as WCW will always hold a sentimental place in my heart. 1.This question I actually posted on the ‘Wrestling Roundtable’ Facebook group page (I urge everyone to check it out and join as it is a great community), with a lot of responses. From what I heard, the reason the WCW fans threw trash into the ring was to create more of a hostile and realistic atmosphere than other federations. WWF and ECW had vocal fans, but they rarely showed their response or emotions through actions. It was also a way for the WCW fans to carve out their own niche. 2. I am not able to answer this question off the top of my head, but I expect the results to be quite surprising. I do not think the number will be high, but I think it will be more than what people think. Once again, great review Mark and I look forward to the next one! Great explanation. As for other shows, I would like Saturday Night as that really was their main show from the mid-80s til Nitro debuted. I have Thunder 1998 to 2001 seasons on DVD and watched few episodes from those years and quite honestly it really wasn’t that great. The first 6-12 months of its debut it was just as good as Nitro but after it really was just a show dedicated to mid and lower card talent, and the matches weren’t that great. There were some hidden gems but I don’t think WWE can fill a Best of Thunder set, however WWE did do a Best of Goldberg so its possible and wouldn’t count them out. If I remember right, some WCW shows allowed Turner customers to use their cable or electric bill (which was also owned by Turner) as a way to score comp tickets. So fans threw stuff because if they were ejected, it’s not like they were paying for their seats anyway. I’m assuming over time WCW just went with it since it made their fans look a lot more into what was going on than WWE’s. I’m curious about the blu ray extras. In particular the Bret Hart vs. Hulk Hogan match. Does Bret enter with or without music on this one? And is Michael Buffer edited out of it as he was on the Hogan Unreleased DVD? Does it include the full ending of the show involving Sting etc? I’m hoping they don’t cut that match out when it hits the UK. Thanks for the reply! Much appreciated. I think that’s a shame though. Michael Buffer always made it feel like the Maaaaaaaaain Event!! Having Bret come out without music was rather odd. I don’t think that’s an edit. WCW actually did that! I would have enjoyed it if they’d put his WWF theme over it.